← Managed Metadata Service error: The Managed Metadata Service or Connection is currently not available. The Application Pool or Managed Metadata Web Service may not have been started. While these days server-side solution looks as if it’s going out of fashion, the fact is quite a number of people are still dependent on them for various reasons. Back in the days when server-side solution was the only (practical) option, CKSDev was one of my must-have dev tools for its ability to quickly deploy assemblies to GAC and files to the Layouts folder. CKSDev however does not work with Visual Studio 2015, and it appears the original author is no longer working on it. While there are a few posts on the web with hacks for installing it on VS 2015, some of the commands that I regularly use resulted in exceptions and did not work correctly. 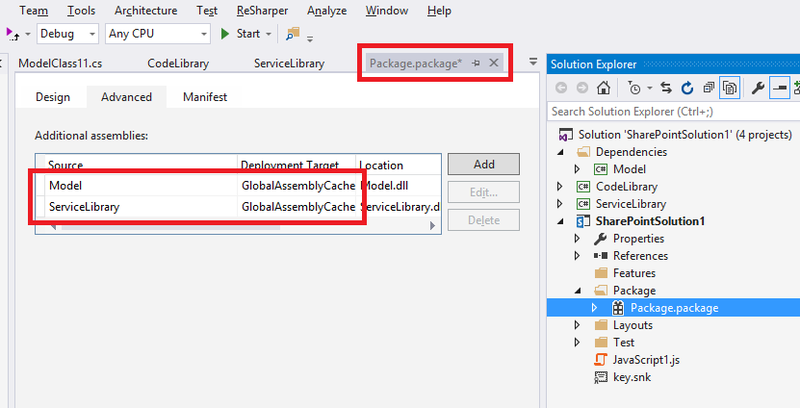 The ability to quickly deploy assemblies to GAC has now been added to SPClientSideDeployment 3.2 (supported for On-Prem only). I know this is not really “client-side deployment”, and it pains me a bit, but at the end of the day what’s important is the productivity gain for developers. In short, it builds the project(s), GACs the relevant output assemblies and recycle the IIS app pool of the target project. Which assemblies will be GACed? This command is enabled on both SharePoint and non-SharePoint projects, and the assemblies that are GACed depends on the type of the target project. With the Package definition below for example, the Model, ServiceLibrary and SharePointSolution1 (target project) assemblies would be GACed. If the target project is a non-SharePoint project, only its main output assembly would be GACed. Which IIS app pool is recycled? Again this depends on the type of the target project. For SharePoint projects, the command uses the OOTB Site URL project property to locate the app pool that should be recycled. For non-SharePoint projects, the command uses the SharePoint URL project property that is added by this extension. OK.. so how do I trigger the command? 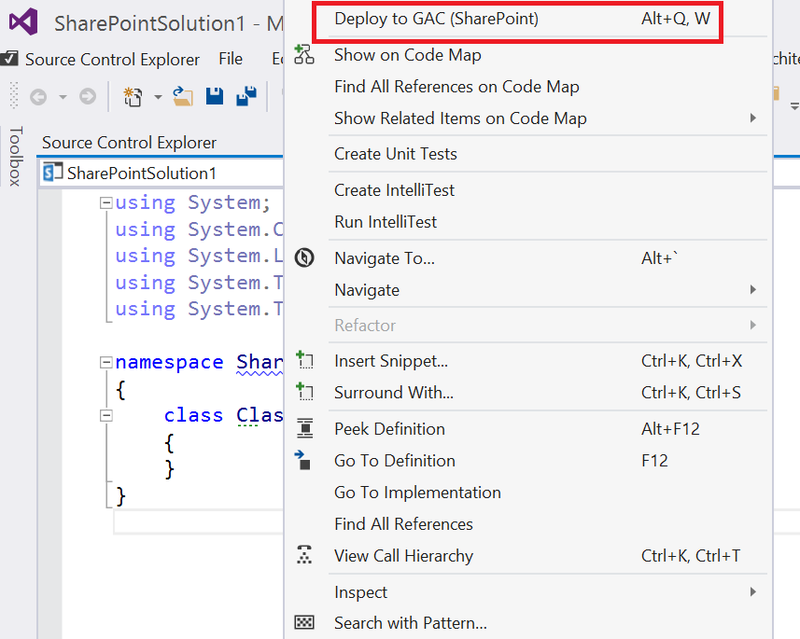 Right-click on the code editor of a C# or VB code file and choose Deploy to GAC (SharePoint). The keyboard shortcut key for this is Alt + Q, W. This will execute the command against the active code file’s project. 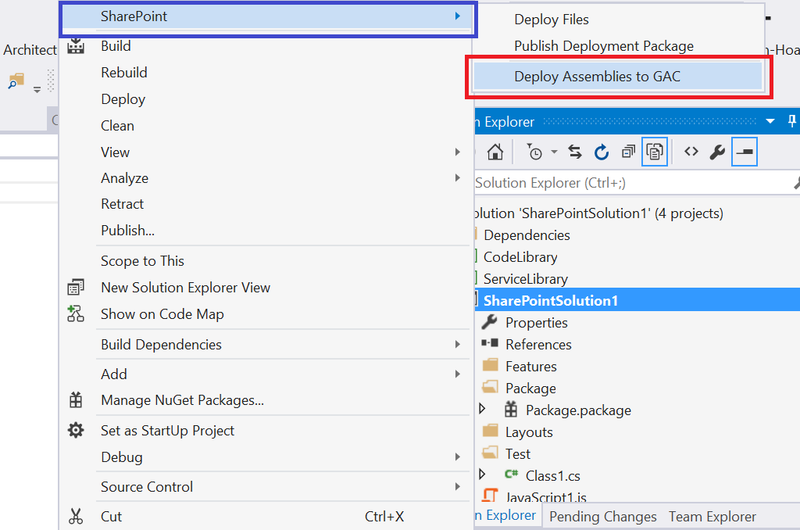 Right-click on a project and choose Deploy Assemblies to GAC (under the SharePoint group). From the Tools menu, choose SharePoint Deployment, then Deploy Assemblies to GAC. This executes the command against the solution’s start-up project. The keyboard shortcut key for this is Alt + Q, E.
I hope you find this new addition useful, and as always, I’d love to hear from you with feedback and suggestion.